Steve went to university to study biology and psychology, mostly so he could play with fish and learn how to make people like him. 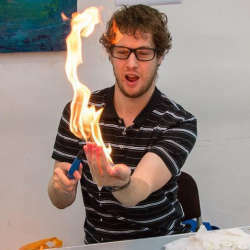 He spends his spare time lighting things on fire and watching cartoons like Adventure Time and Bob’s Burgers. He also sometimes plays video games. What On Earth Is This Bizarre Creature, And What Is It Shooting? Freaky Video Puzzles Internet: Can You Tell If This Is A Robot Or A Human? What On Earth Happened To This Bear's Tongue? !